We’ve been staying at the iconic Fairmont Banff Springs Hotel for almost twenty years. This small, tucked-away room had always intrigued me. Formerly, in the hotel’s heyday, the space served as the elegant ‘Writing Room’ for its guests. What an incredible spot this would have been to pen a missive or two about one’s adventures in the Rocky Mountains. The stonework, woodwork and large vaulted window with lovely stained glass panels show the care and attention that went into even the nooks and crannies of the ‘castle in the mountains’. It’s truly impressive to look at, and fun to imagine guests of long ago sitting near the window perched over pen and paper, looking up at the breathtaking mountain view. 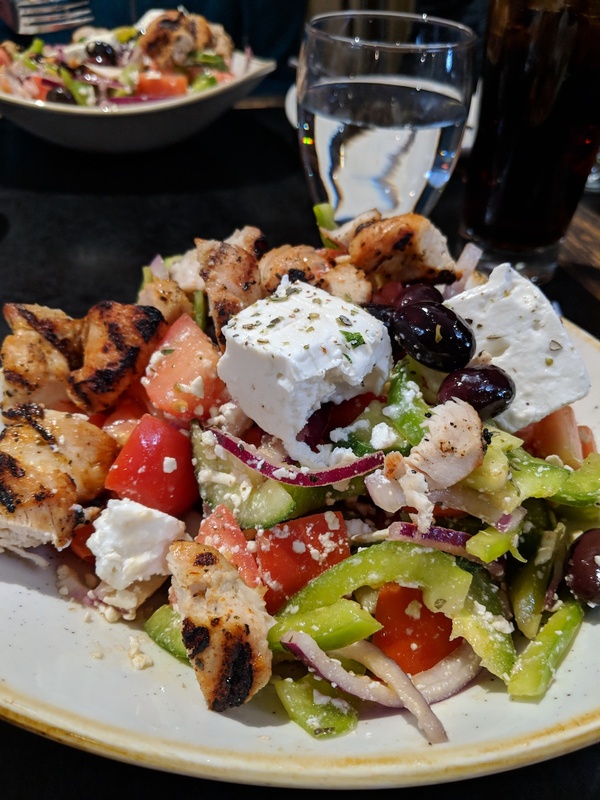 Cured meats, smoked fish, handcrafted pates and terrines, a selection of delicious Canadian cheeses, fresh baked breads, artisanal crackers, pickled vegetables and warm olives — and of course a nice selection of wine by the bottle or by the glass. 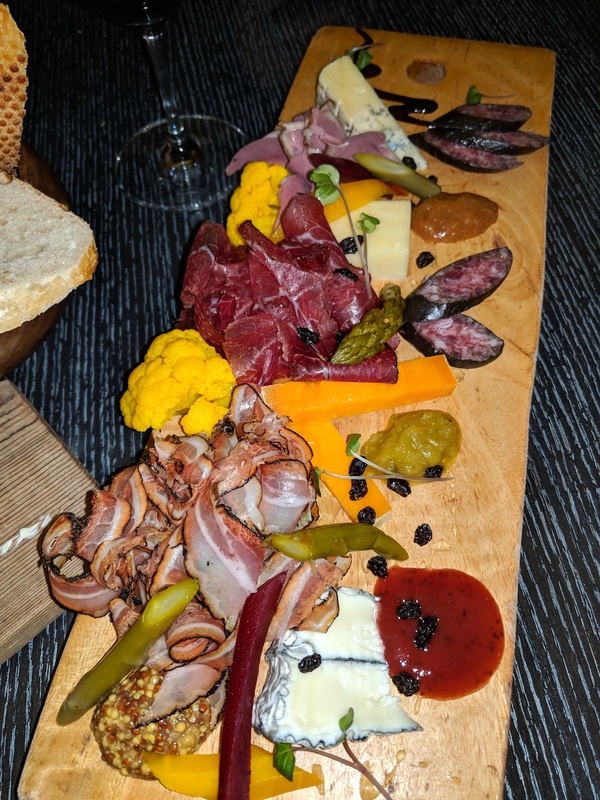 I often think of this as my style of eating – small bites of delicious meats and cheese and treats presented on beautiful boards while sipping wine. In a setting like this, it can hardly be better. As you can see, the presentation is spectacular – rustic and artistic at the same time. 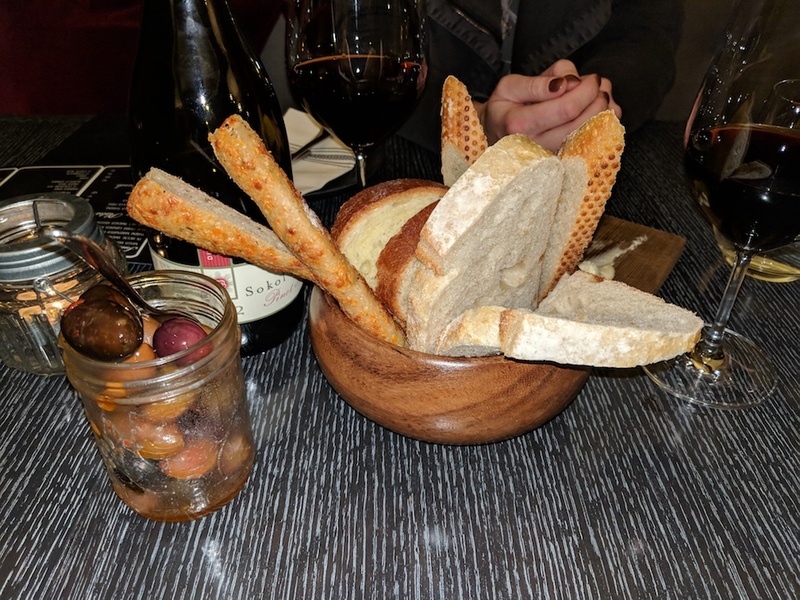 We started off with a wooden ‘basket’ of warm bread and fresh butter, along with a mason jar of warmed olives – so good. We then moved along to the Chef’s Medley Board, quite willing to be surprised and delighted by her customized selections – which we were. The cured meats were delicately shaved just before serving, and piled up in generous, tempting mounds of goodness. On our board was paper-thin speck, bison, and smoked duck (in the photo below, start from the bottom and move your eyes up the board). Interspersed among the meats were scrumptious pickled vegetables (cauliflower, beets, asparagus, carrots) and three gorgeous chesses: Britannia 3-year cheddar, Pacific Rock with washed rind, and the lovely Bleu Fume (we love a pungent blue, but this milder take would be more widely appealing, I think). Tying the board together were the dollops of homemade jams: blueberry ( – I think! Unfortunately my notes are sketchy on this one), a savory green tomato, and a spicy peach. 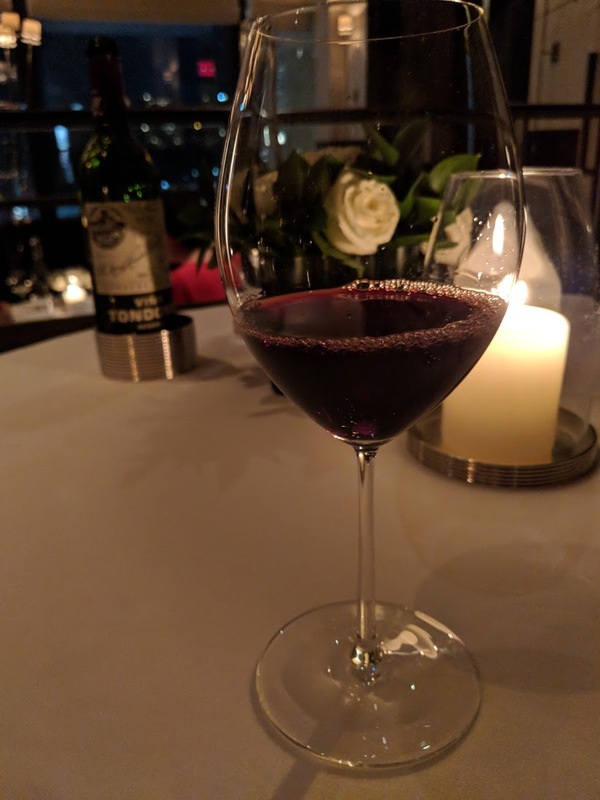 Though wines were available by the glass, we opted for a bottle of Pinot Noir knowing it would pair well with just about anything we ordered – and we planned to keep our options open! 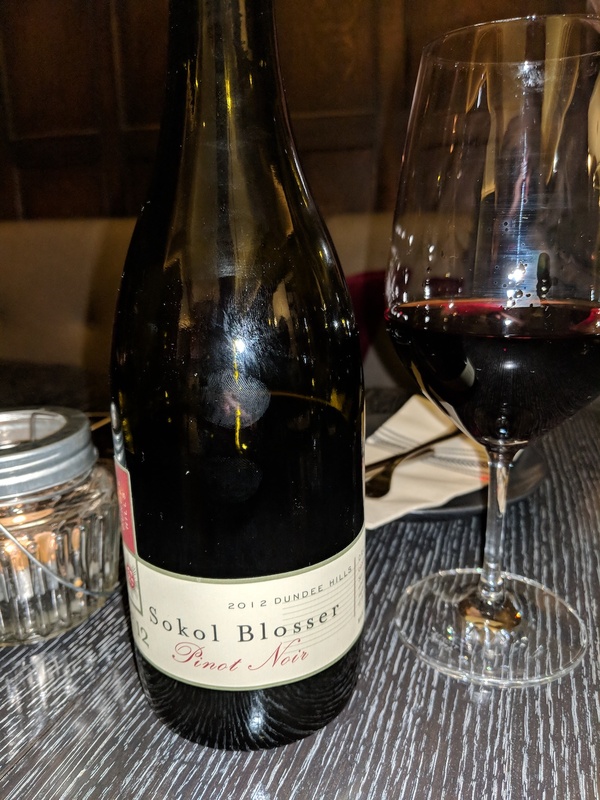 We chose the 2012 Sokol Blosser enjoying every berry warm/spicy sip. And then, even more fun ensued. 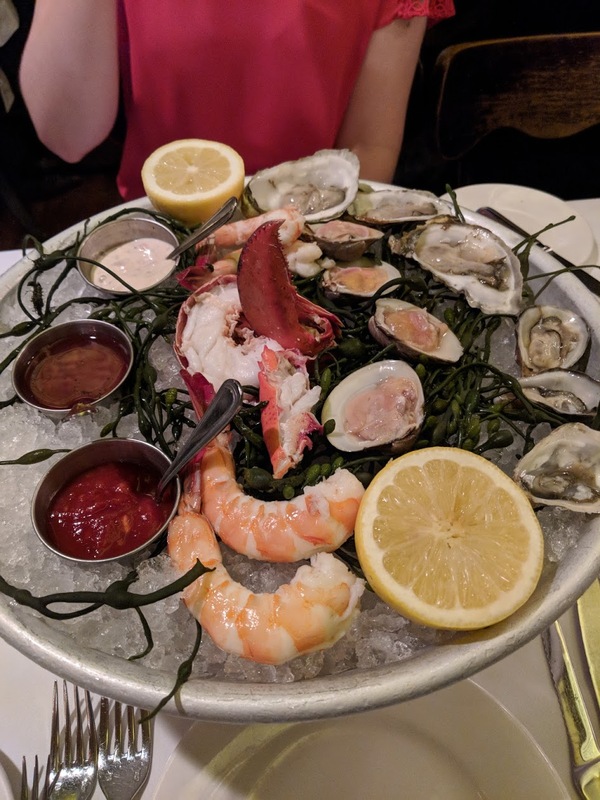 Even after feasting on the bread, butter, olives and charcuterie board above, it was hard for us to ignore the incredible fish boards that kept drifting passed our table. We just had to add it to the meal. 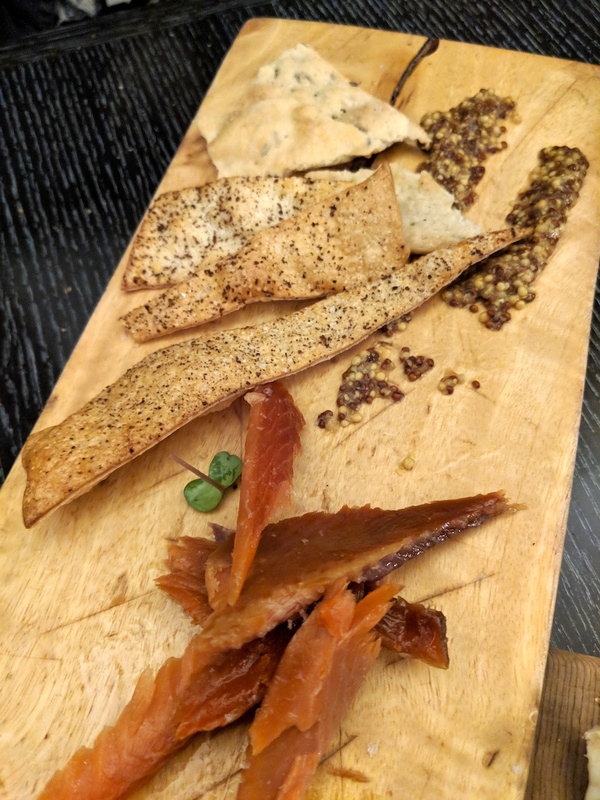 The fish board was another feast for the eyes, with delicate pieces of house hot smoked salmon, crispy black pepper crackers, crackers baked with licorice-y caraway seeds, and a dollop of grainy mustard. 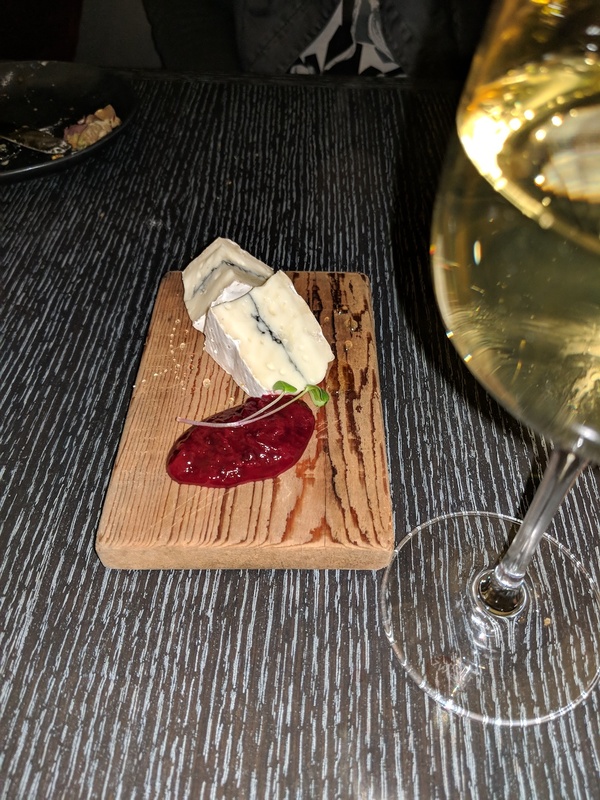 To finish the sumptuous meal of many treats, we ordered a generous wedge of Le Cendre des Pres, a triple-cream Quebec brie with a line of maple ash in its center, and fruity jam. Paired with a glass of Chardonnay, the night was complete. I have to make a special note of the truly great service we enjoyed here at Grapes. There were only two servers for the room, as well as the chef busily preparing boards behind the bar. 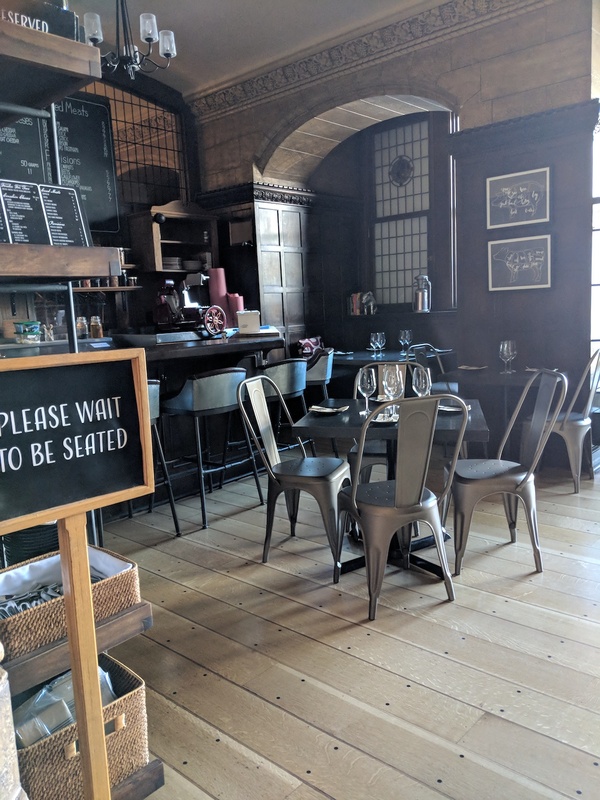 Despite the small size of the room, the constant orders of boards, small plates, and ‘a little more this and that’ kept them very busy. 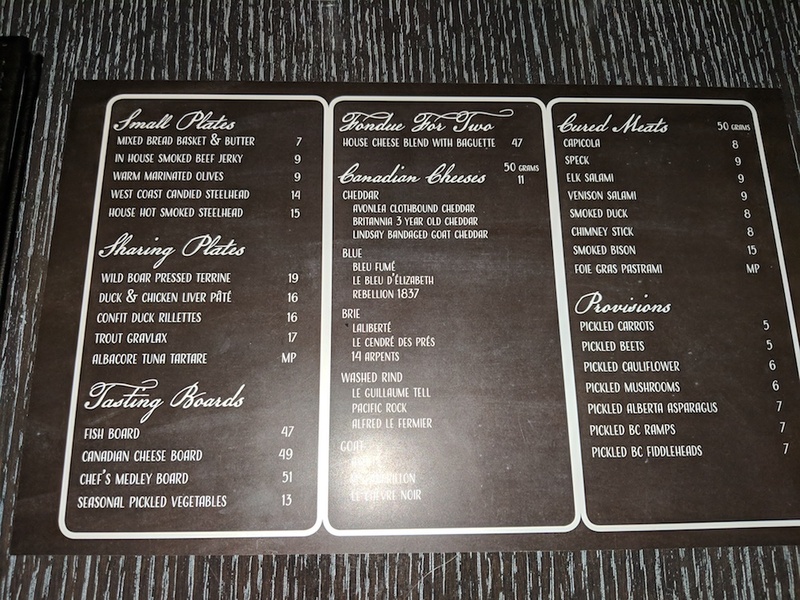 They remained very helpful and friendly, with an excellent knowledge of the menu. Impressive! 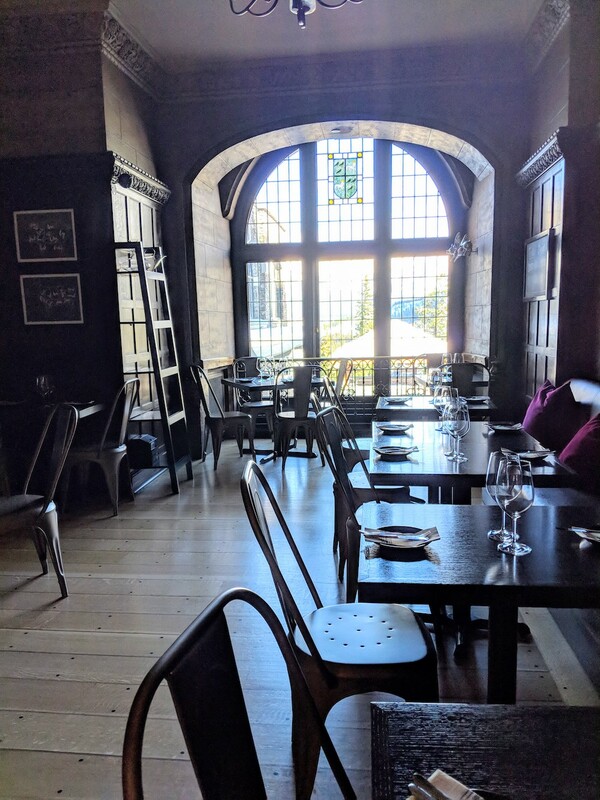 Make a stop at Grapes a must on your next stay at the Fairmont Banff Springs (but make reservations!). For more information about Grapes Charcuterie Bar Cellar, call 403-762-6860 or visit the restaurant’s webpage at www.fairmont.com . 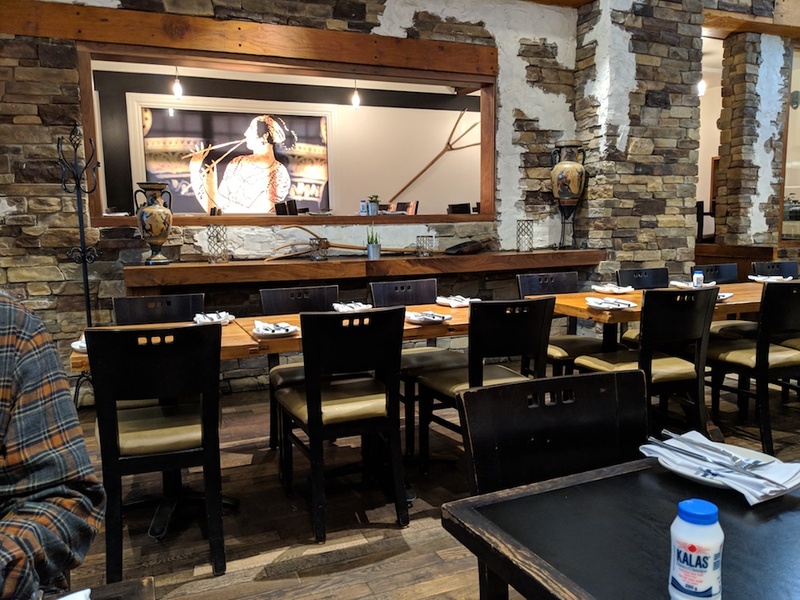 Reservations can be made by calling 403-762-6860 or through Open Table. 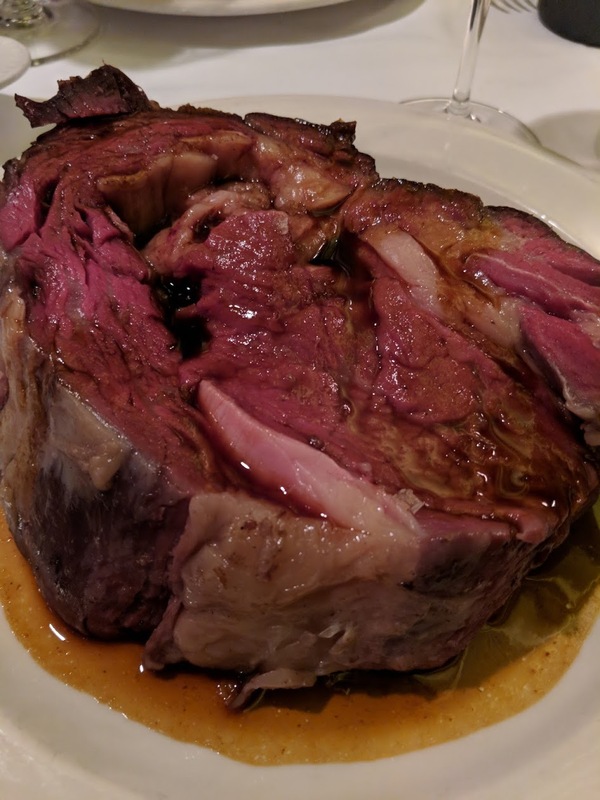 I think this photo of the Prime Rib of Beef (King’s Cut) says just about everything you need to know about Keens Steakhouse. This place is seriously old school, with honest, generous fare. 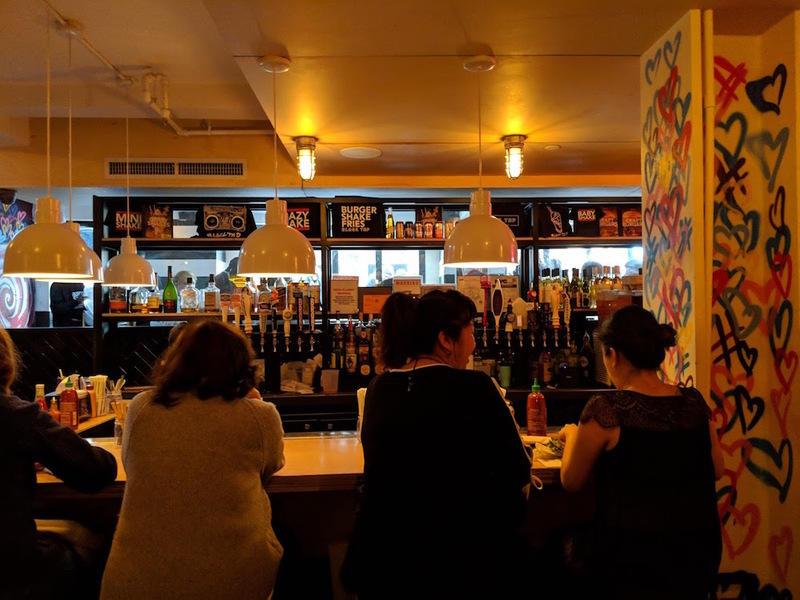 You also get the feeling that little has changed over the 100+ years since its establishment – from the menu to the decor to the quality service – and that’s a very good thing. 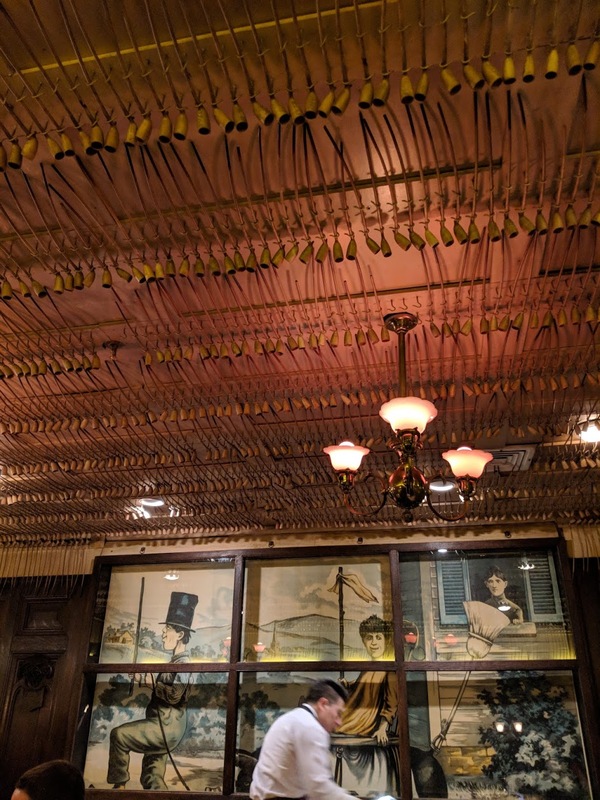 In fact, a reminder of Keens’ traditions hangs right above your head as you dine. Apparently the largest of its kind, there is a collection of tens of thousands of churchwarden pipes adorning the ceiling. Keens kept the pipes ‘checked in’ for patrons at the restaurant for use when they came to dine. Pipes belonged to such illustrious gentlemen as Teddy Roosevelt and Albert Einstein, and other notable members. 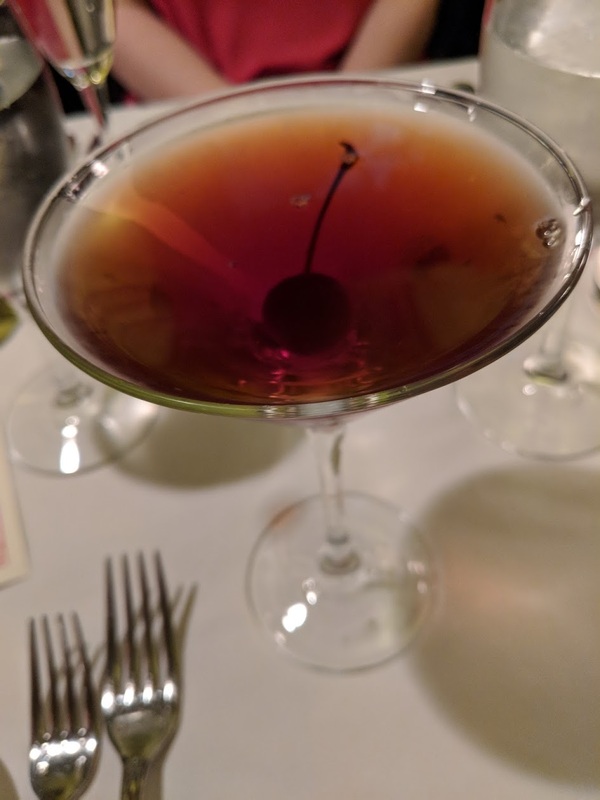 But before getting to after dinner, let’s begin at the beginning, which for us (fittingly) was with a Manhattan – very nice! 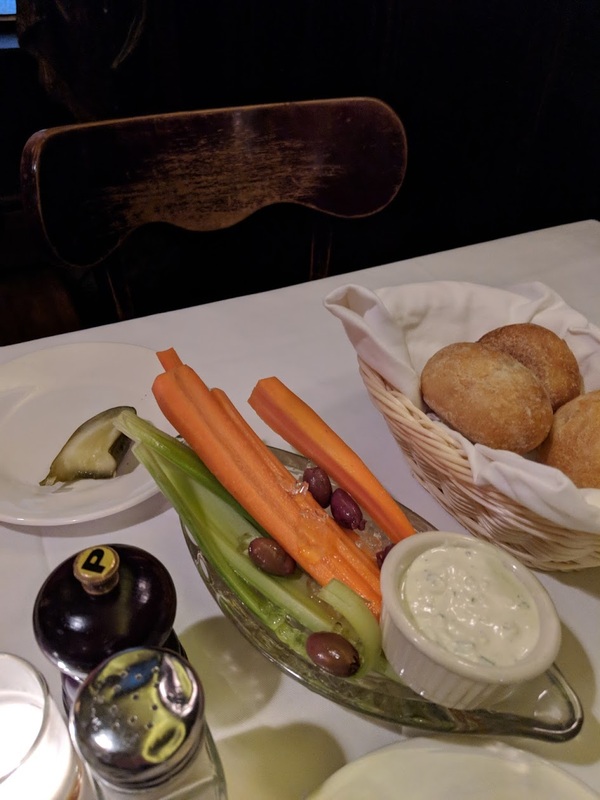 A simple assortment of crunchy crudites and salty olives with creamy dipping sauce, homemade pickles, and invitingly warm rolls were also brought to the table to enjoy. – it was really just what we wanted in its simplicity. A nice touch! 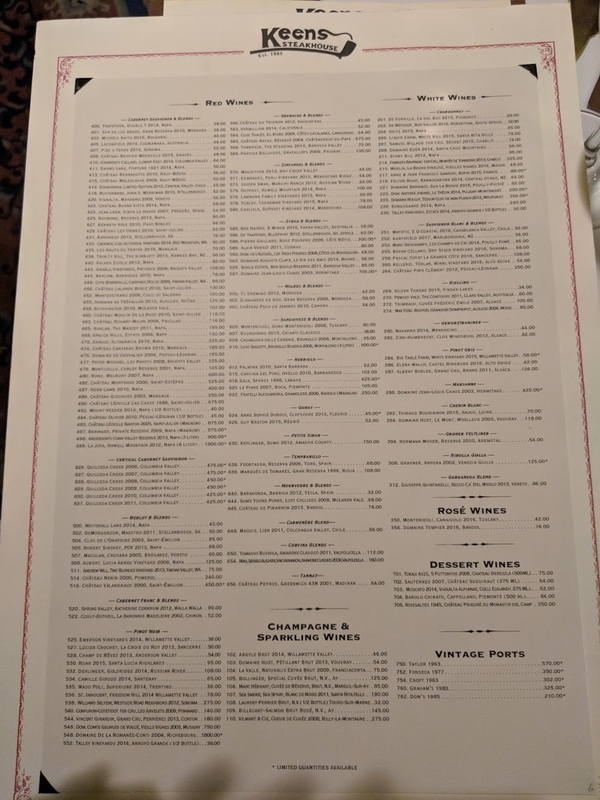 As mentioned, the wine list is short but beautifully on point. 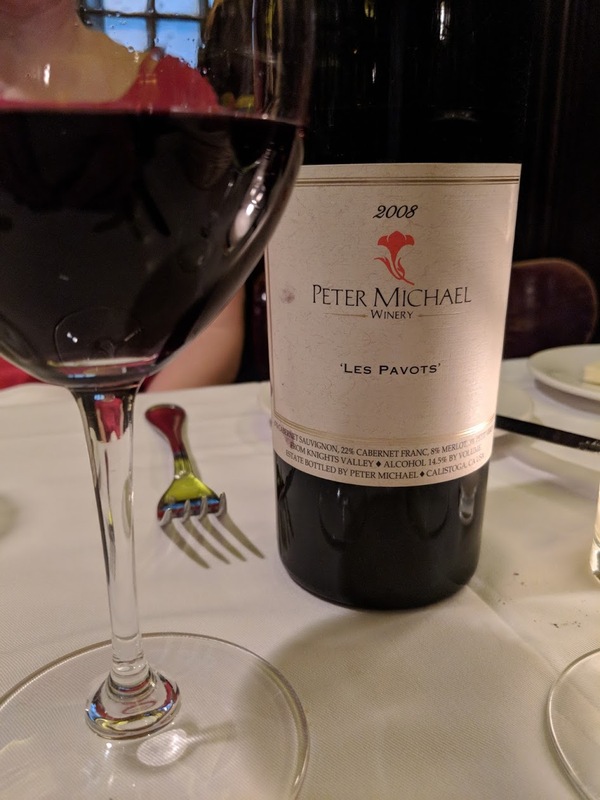 To accompany my companion’s King’s Cut of Prime Rib and my Prime Filet Mignon, we ordered the Peter Michael 2008 “Les Pavots”. It was elegant and deep both flavour and colour. A great accompaniment to the hearty flavours of our beef entrees, the accompanying rich sauce and the earthy wild mushrooms. I should make mention at this point of the great, attentive (but not at all instrusive) service. A perfect blend of care, conversation, and privacy. The general atmosphere was warm, pleasant and jovial. A family sat next to us, and elsewhere couples and groups of friends met for a great meal and great time. I mean, this is why you go to Keens, for the beef they’ve been doing forever, dry-aged right there on their premises. 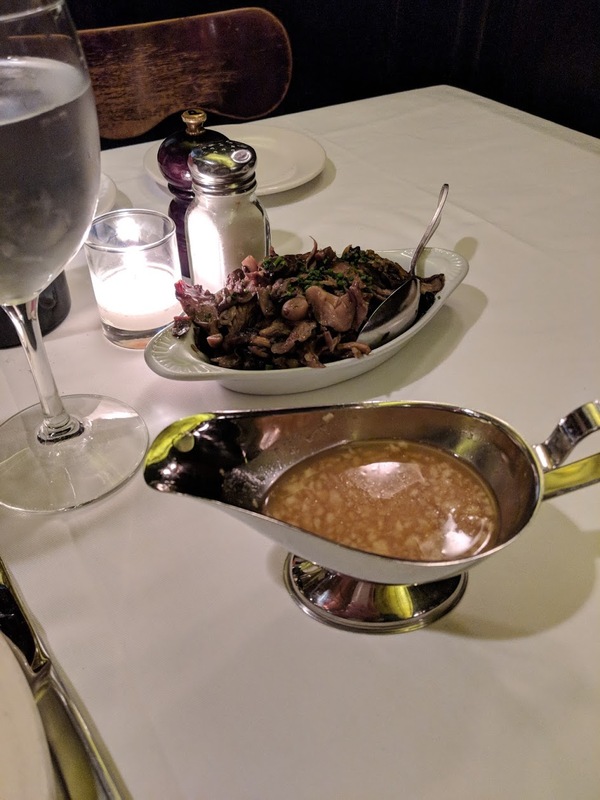 It was perfectly seasoned and prepared, and each bite was decadent and delicious. You can taste it, can’t you? Well…we were more than satisfied, but we weren’t going to wander back to our hotel (and the next day ultimately all the way home) without one last taste of dessert. 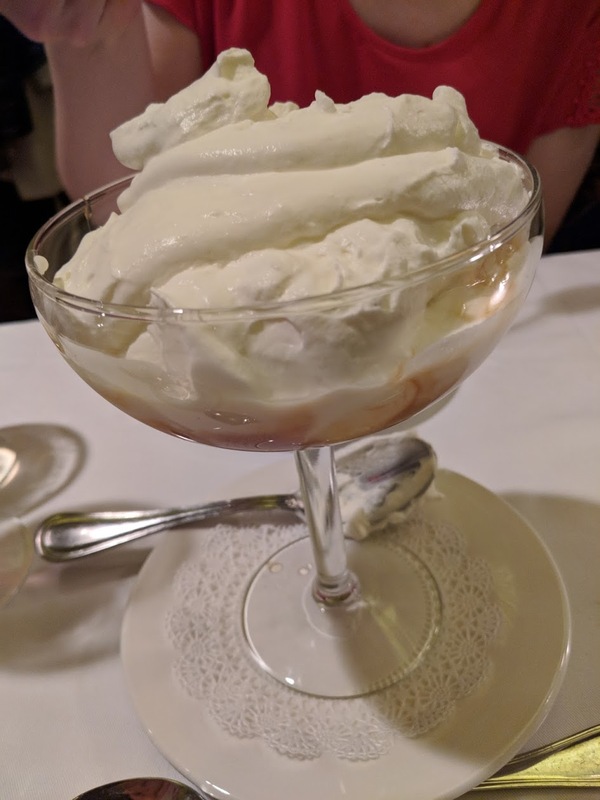 So, we shared a massive Butterscotch Sundae – yes, ice cream and a hot, beautiful butterscotch sauce are buried somewhere under all the beautiful whipped cream! 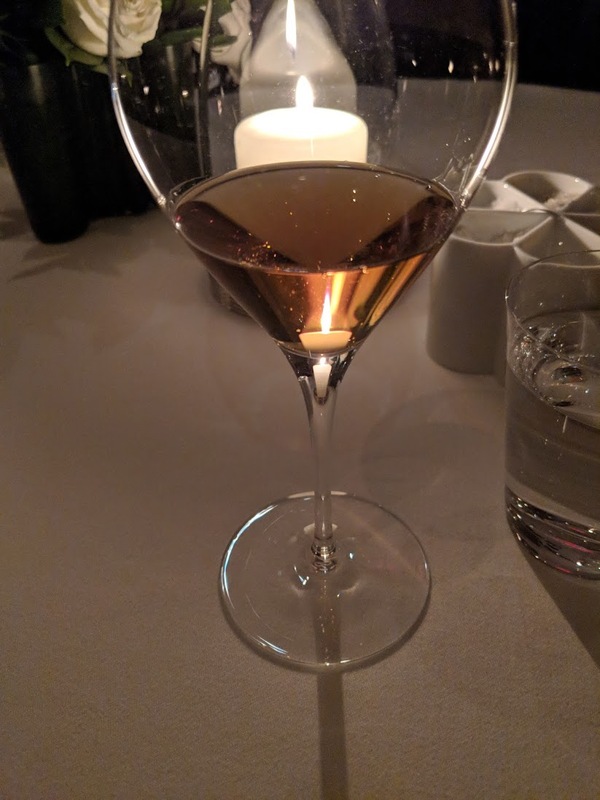 Paired with glasses of cognac recommended by our server, it was a masterful finish to a delicious meal. 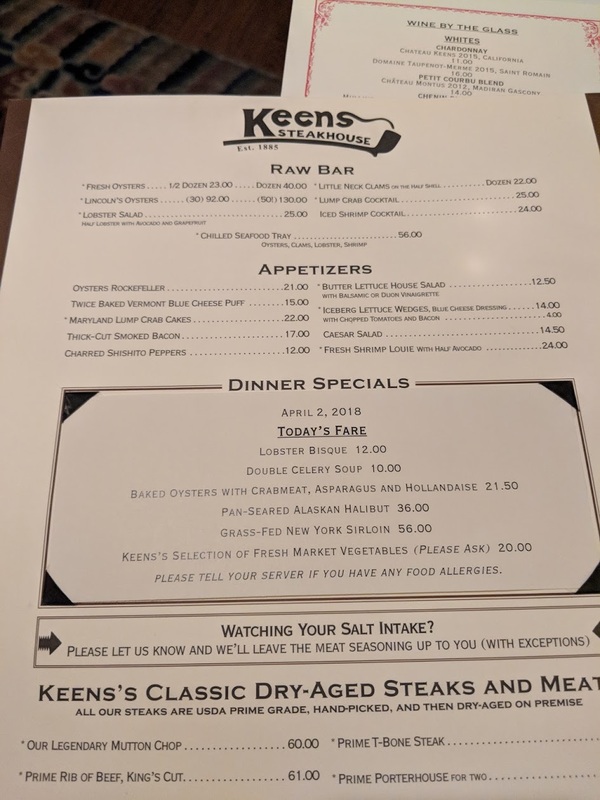 If you go to New York and love a traditional steakhouse experience – or want to try the ultimate one for the first time – do go to Keens. Call (212) 947 363 for reservations. Visit www.keens.com to view the menu, read about the restaurant’s intriguing history, and for more information. 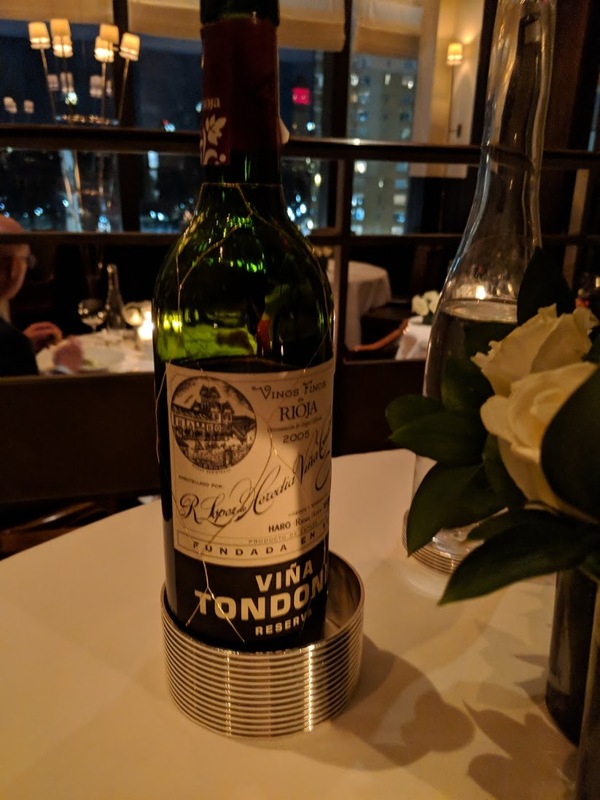 From the phenomenal food and its artistic presentation, to the outstanding service, to the spectacular view – everything about this meal marks it as among the very best. 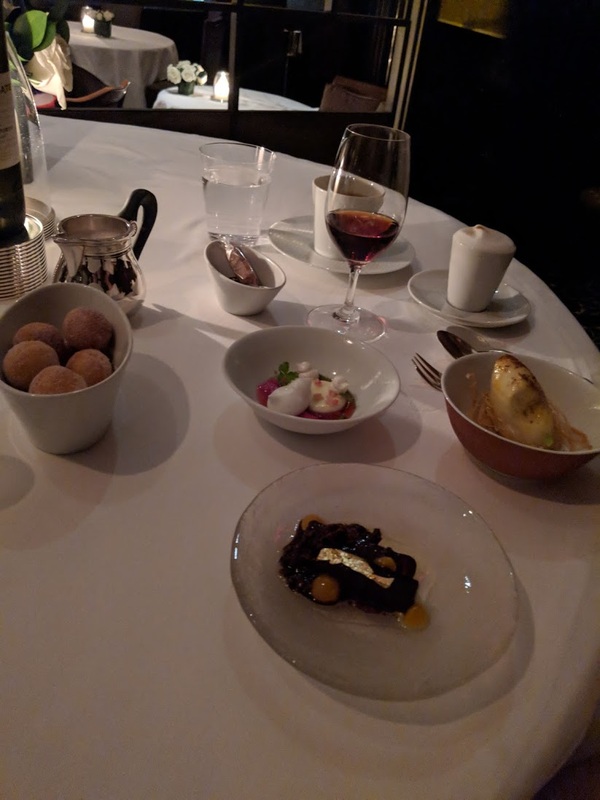 A changing nine-course tasting menu is offered daily, and along with it we enjoyed a wine pairings menu assembled from Per Se’s remarkable, award-winning wine list. This is a dream of a restaurant that you need to try. Let me first say that you may read reviews and stories that question Per Se’s location ‘in a mall’. It’s true that the restaurant is located on the 4th floor of the Time Warner Center. I can actually understand the surprise at finding such an upscale in a shopping center. But please don’t let this discourage you from eating there, please – you’ll be missing out. First of all, the ‘mall’ itself is very tasteful, including several upscale boutiques. Second, the top floor location and the subdued, elegant decor lifts you right out of the shopping world anyway. Third – the VIEW! Large windows allowing you to take in Manhattan’s iconic Columbus Circle, Central Park and the lights of the New York skyline – this is a feature of Per Se, not a liability. Don’t let the word ‘mall’ evoke the wrong image and cause you to miss out! So, with that out of they way, come with me on a little visual journey of our nine-course meal with wine pairings. 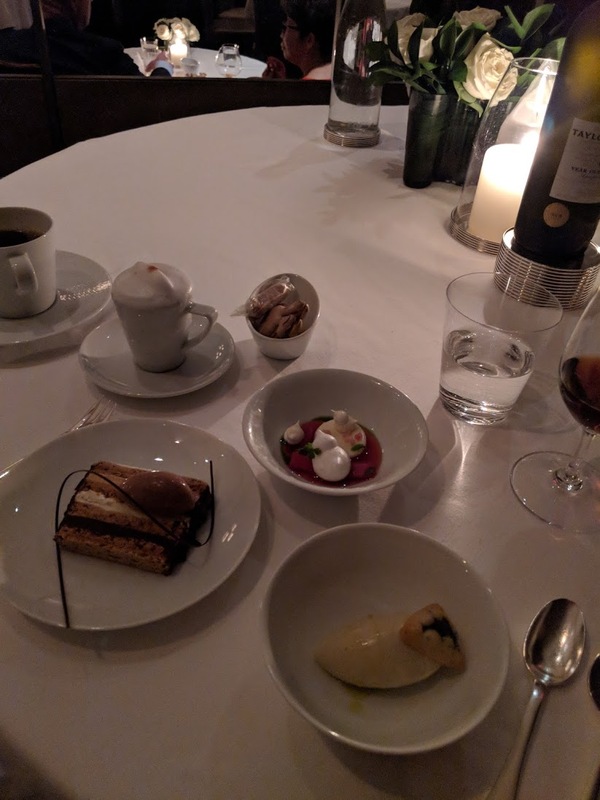 Not pictured but implied is the incredible service that was attentive, friendly, and personal making us feel like honoured guests – it really was impeccable. (As the story goes, apparently a professional choreographer was brought in to train staff how to move, clear, and serve with the deftness and ease of dancers, and it shows – or rather, doesn’t – adding to the magic of the experience.) Also, as I’ve said elsewhere, I have number of dietary restrictions. Not only were all those who served us aware of all my allergies, modifications were made where necessary so that I could enjoy each dish without the sense that I was giving anything up. 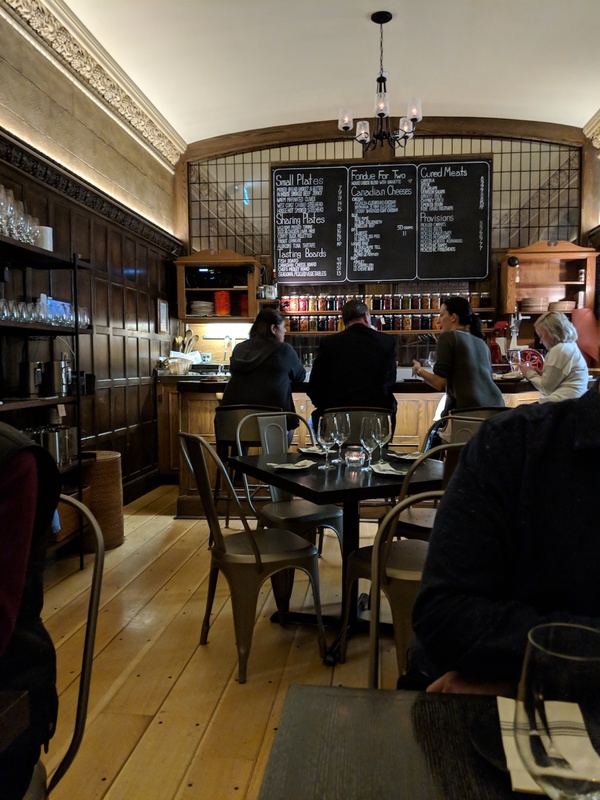 In fact, the maitre d’ and I began the evening with a chat where he clarified each of my concerns and then let me know what they had already planned to accommodate me. I was not only put completely at ease – which is really all we ‘allergy people’ want – but I was truly made to feel that my experience would be just as phenomenal as it would be for someone with nothing to worry about. 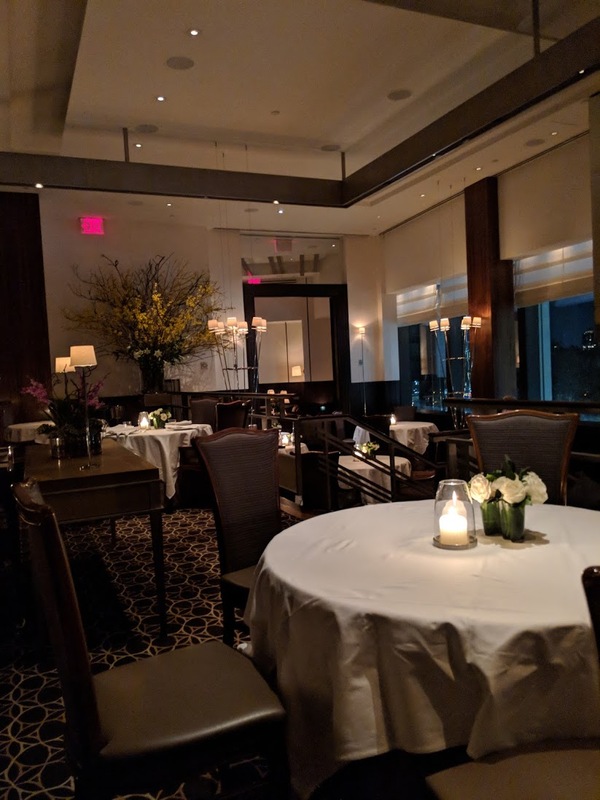 They really handled this beautifully, and I would suggest that no matter your restrictions or concerns, the team at Per Se is able to rise to the occasion. Back to the magic! 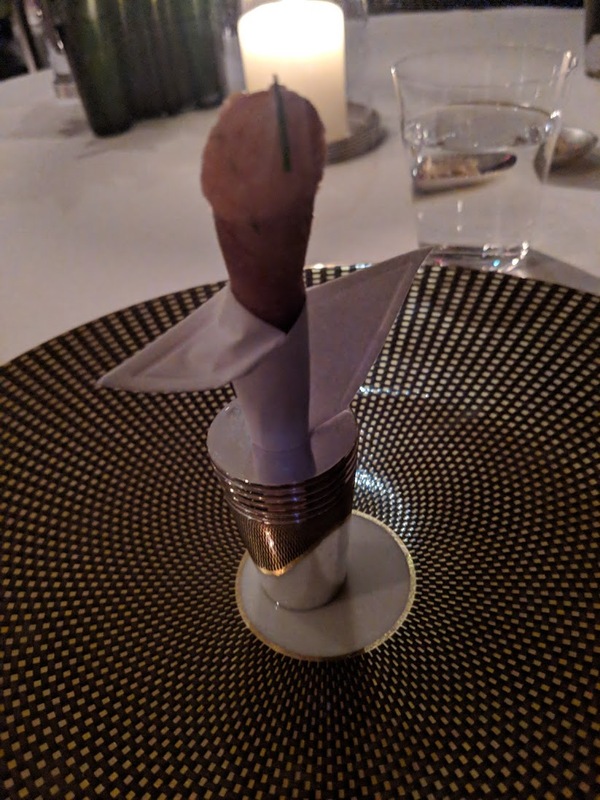 As you’ll see in the photos above and those that follow the art of presentation; design went into the arrangement of each dish, including the gorgeous Amuse Bouche above that began our meal – Thomas Keller’s signature Salmon Cornet, a delicate cone filled with salmon tartare and red onion crème fraîche. 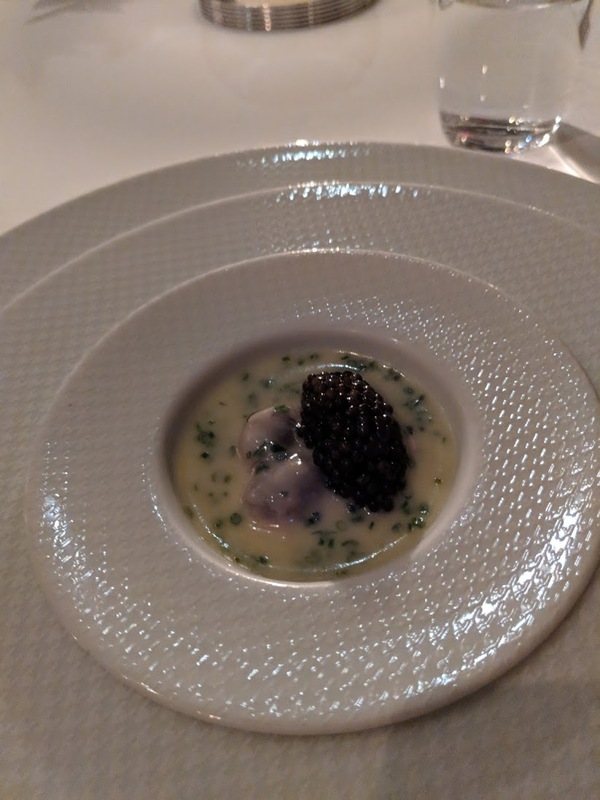 We moved on to “Oysters and Pearls” (above), a combination of tapioca with oysters and caviar. This was a rich and creamy dish, with pleasant ‘bubble-burst’ textures from both the tapioca and caviar. Surprising, and very luxurious. Them came the Hudson Valley Moulard Duck Foie Gras, the first of the dishes bearing some color. I couldn’t help but think I was looking at a lovely painting on a white canvas. It was rich and sumptuous not only to eat, but to look at. We sipped on the proper and perfect (only?) pairing for Foie Gras, Sauternes (the cold liquid gold Chateau d’Yquem). 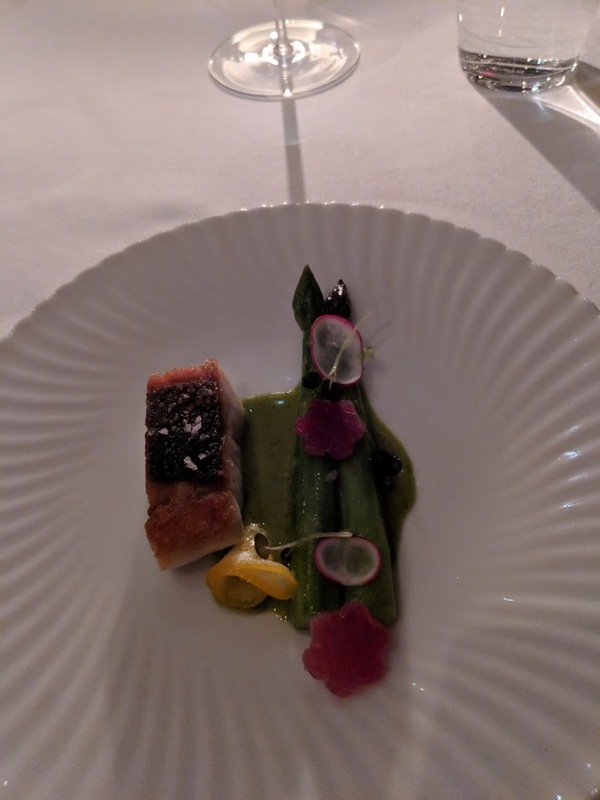 The Foie Gras was followed by the Sauteed Fillet of Mediterranean Lubina (sea bass). It was tender and crips and accompanied by delicate vegetables (asparagus and radish), along with Meyer lemon and “Plancton Marino”. So pretty, and somewhat ‘refreshing’ after the rich amuse bouche, “oysters and pearls”, and foie gras. 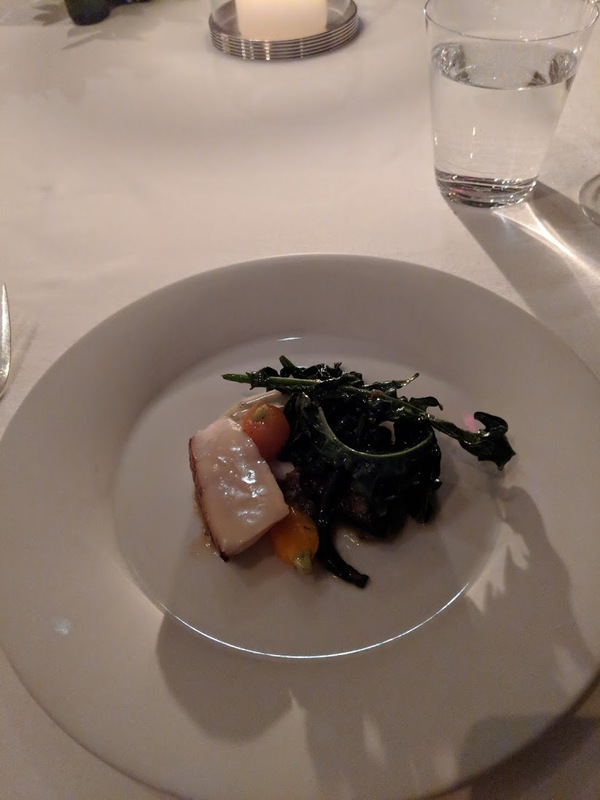 This and the next course, also seafood (scallop), was paired with glass of crisp Sauvignon Blanc (Kenzo Estate Napa Valley 2016). I have to stop right here and acknowledge that this is sounding and looking like a lot – and it is truly decadent. 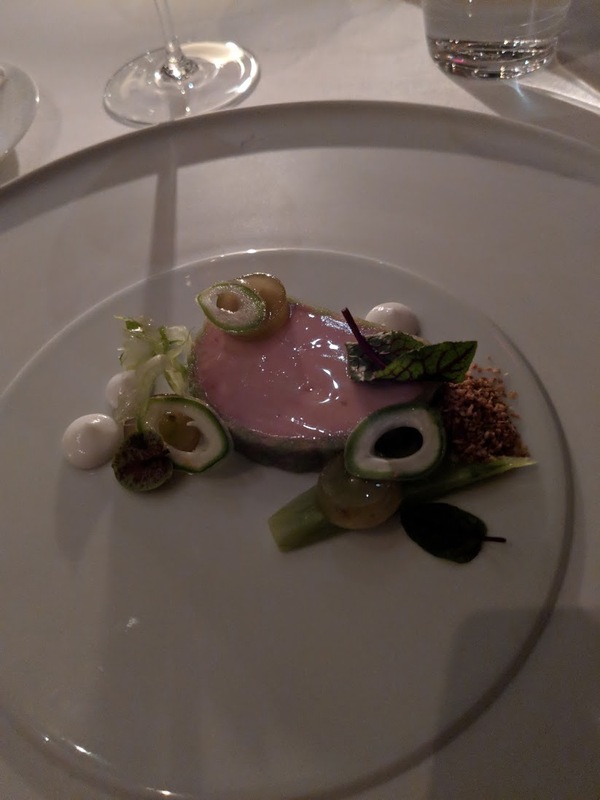 But I can also tell you that there was something about the pacing of the courses – and how each bite was a ‘discovery’ – that caused the focus to shift from quantity of food and onto pure experience of food, a pleasure. 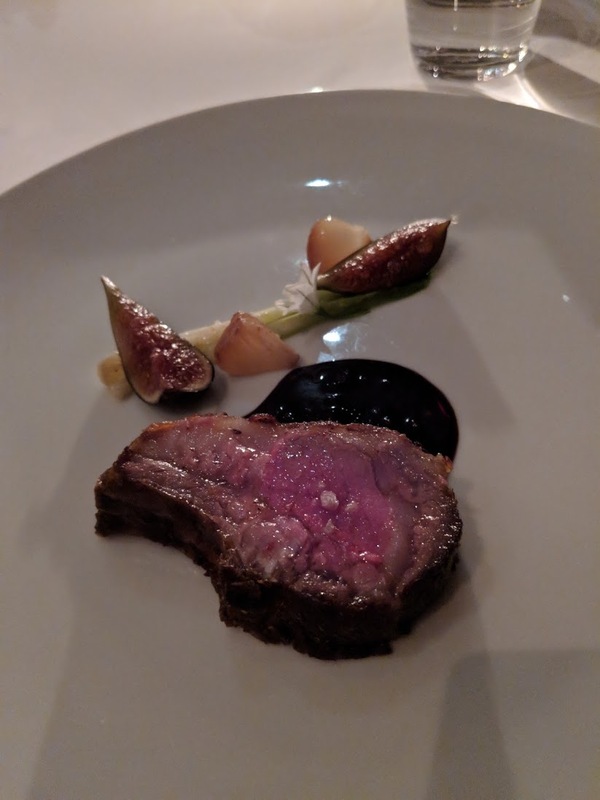 Below is a photo of another standout dish of the evening – the Rib-Eye of Elysian Fields Farm Lamb with Black Mission Figs, Caramelized Cipollini Onions and a Rosemary-Balsamic Sauce. The lamb was perfectly cooked (as you would expect), but those tender figs! 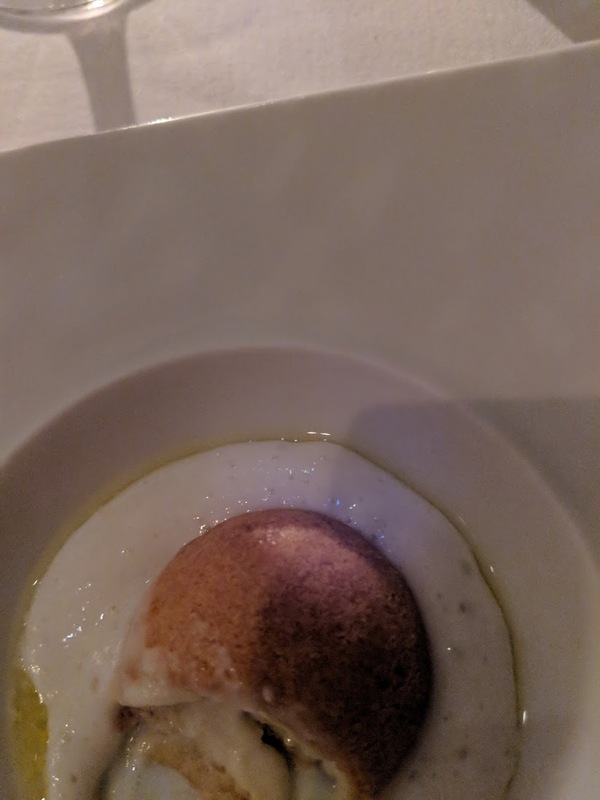 They offered a sweet little bite to play off the rosemary-infused balsamic sauce. Earthy and fresh at the same time. 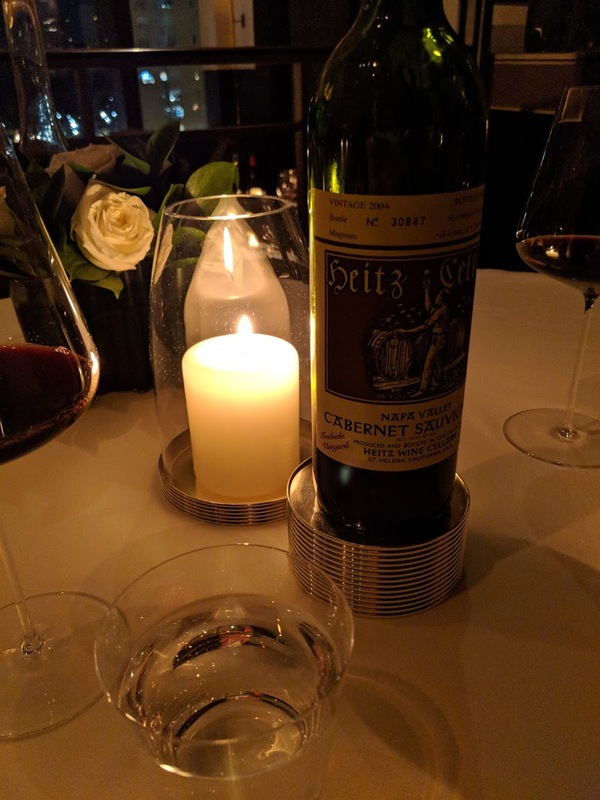 The wine served with the lamb, the Heitz Trailside Vineyard Cabernet Sauvignong (2004) was a jewel red color and went down very smoothly, another beautiful pairing. 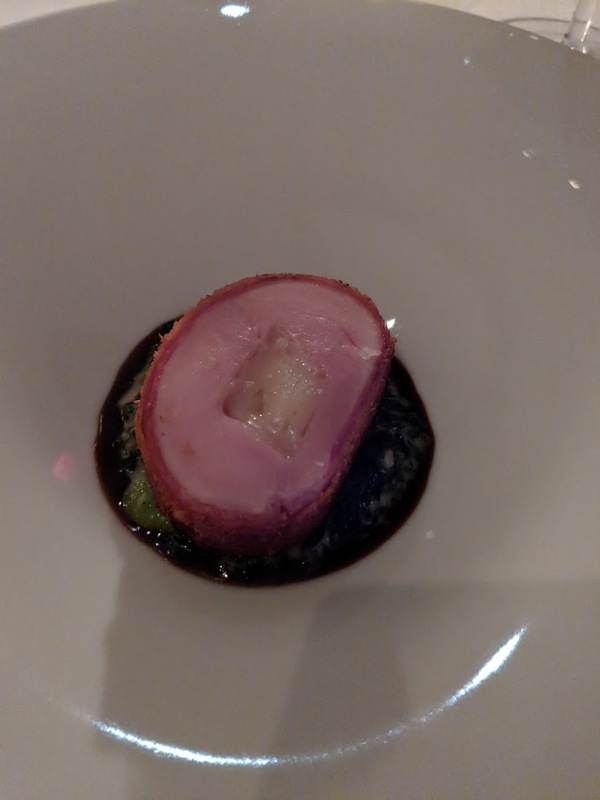 So here I go with ravings over ‘bread’ again -pastry really – but another unexpectedly amazing course – Gourgère with Aged Gruyère. 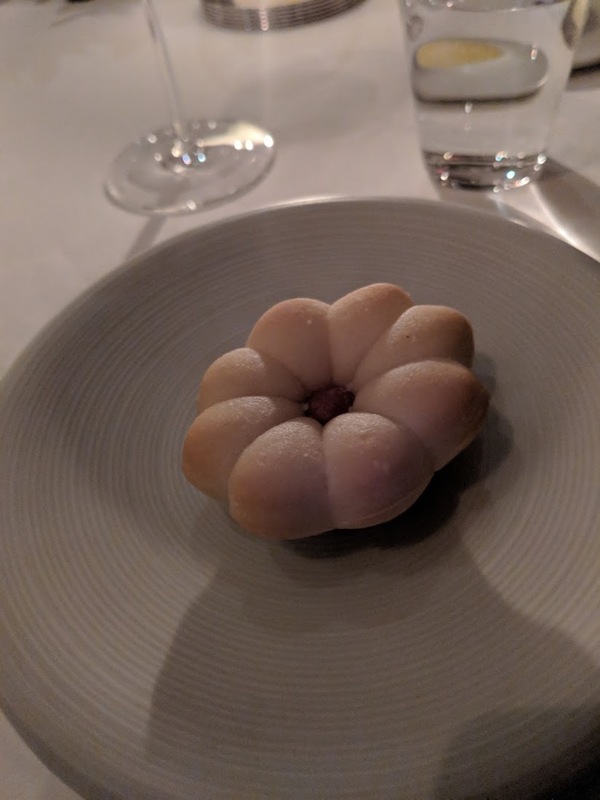 Warm and comforting, with hot, bubbling cheese bursting from the center of a perfectly formed choux pastry – what a great twist on the already ingenious idea of the cheese course. And now we move on to pure fun, even whimsy, as plate after plate of dessert arrived. 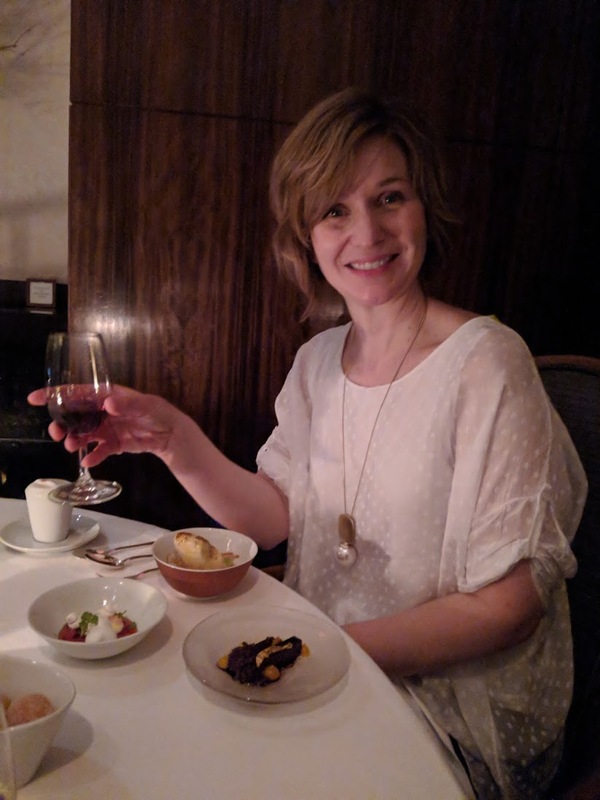 Note the pure joy on my face and the five dessert dishes you can actually see in the shot (that business to my right is yet another dessert, topped with a meringue confection). Per Se really comes out to play for the dessert course, literally inundating you with sweet treats. The chocolate olive oil magic (topped with gold leaf) pictured below was seriously one of the most divine things I’ve ever tasted. 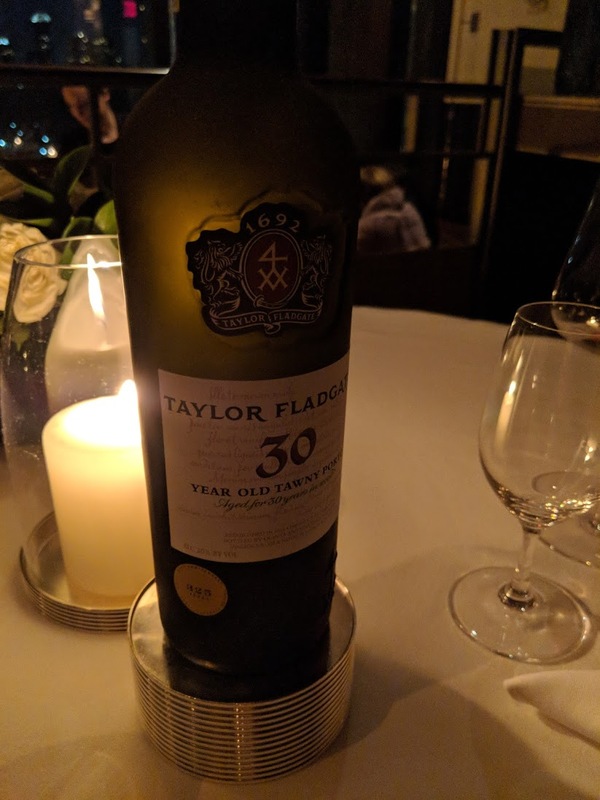 The sweet, delectable items were paired with warming glasses of Taylor Fladgate 30 Year Old Tawny Port. 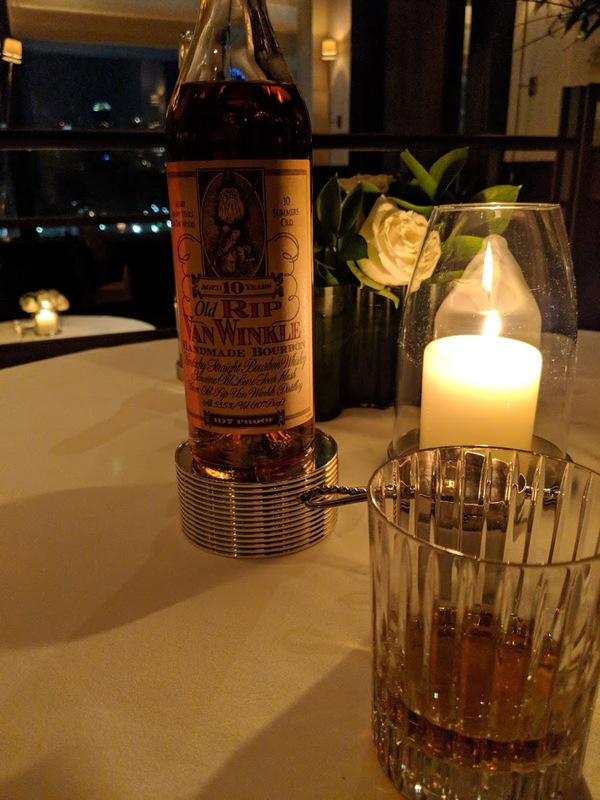 Then, much to my dining companion’s delight, Per Se carried the extremely rare and wonderfully flavorful Old Rip Van Winkle Ten Year Bourbon. You just can’t find this stuff anywhere – and the copper-color beverage was bold, warming, spicy, and everything he’d hoped. What a way to end not just a meal, but an epic food journey. 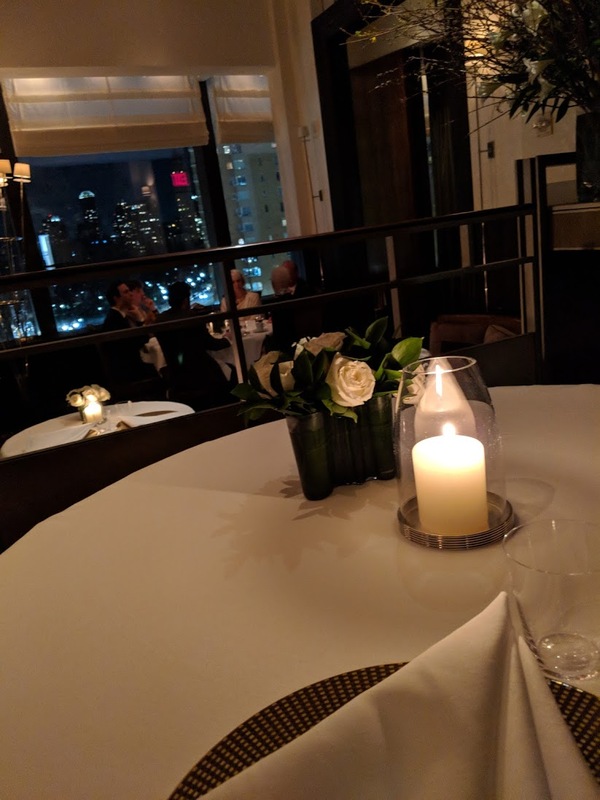 If you love food, wine and culinary adventure, and you find yourself in New York, do make reservations at Per Se. In fact, it may be the reason you go in the first place. 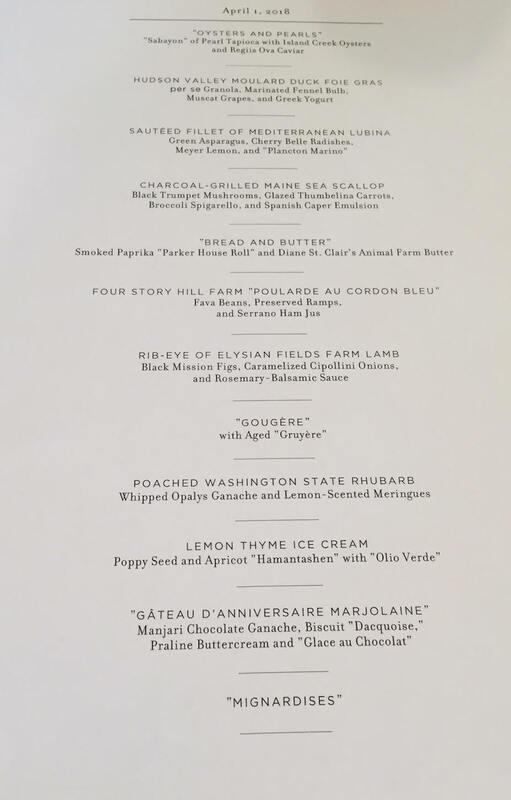 Visit www.thomaskeller.com/perseny for reservation inquiries, and for more information about menus, pricing and location. 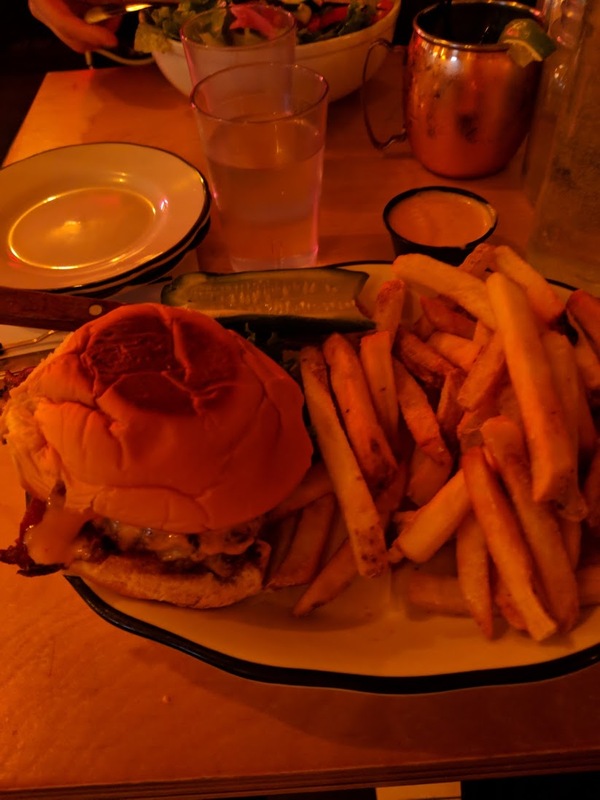 If you’ve got a hankering for a tasty burger and have the time and inclination to line up outside (we were told an hour, but hung out in line for only about 45 minutes or so on Easter Sunday around 1pm), Black Tap Craft Burgers and Beer is a fun and tasty choice. 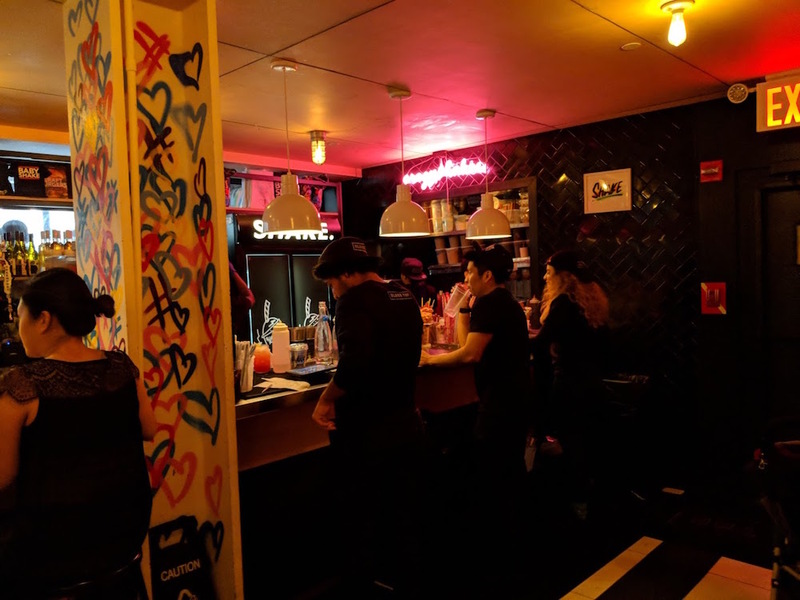 Packed with family groups (this was Sunday afternoon, afterall…) and young people grabbing a bite, it was a lively and colourful time, accompanied by loud thumping beats from the 80’s and 90’s. 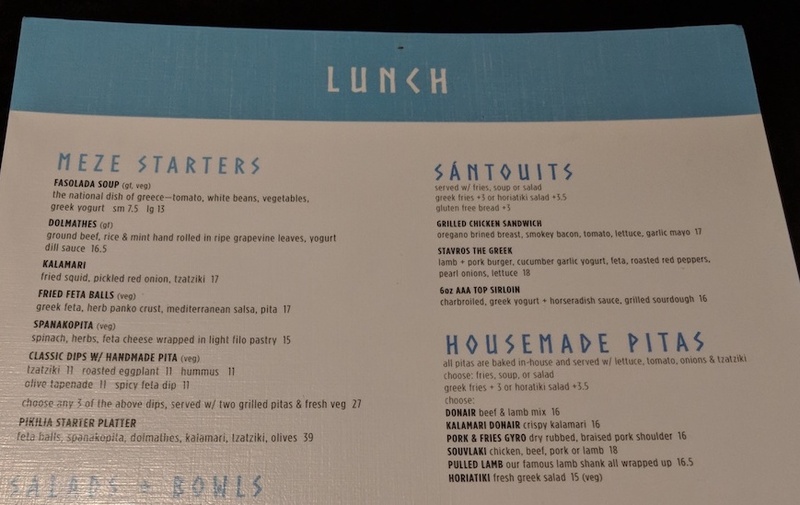 Service was very friendly and quick, and the menu had – as promised – lots of craft burgers to choose from (including All-American, Pizza and Falafel-inspired options). 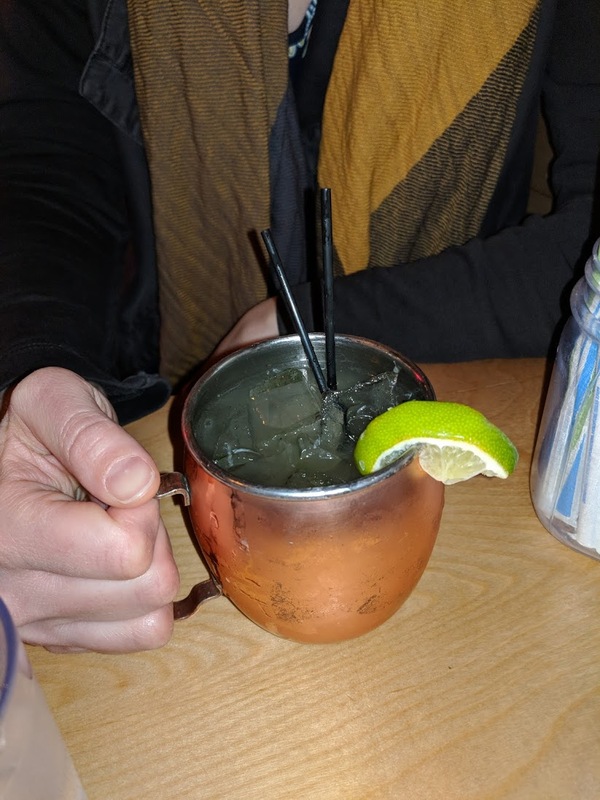 Beers and cocktails looked promising, so I had one of my go-to’s – a frosty cold Moscow Mule. 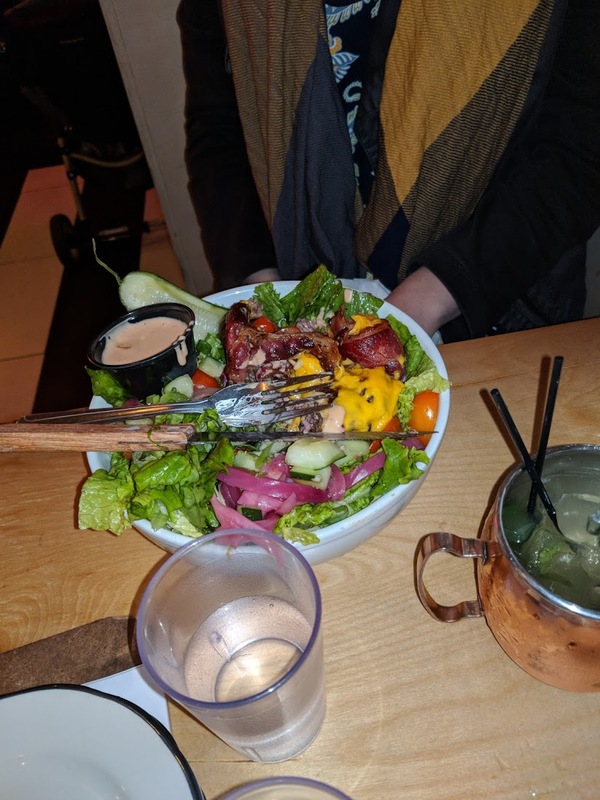 I went low-carb – but not altogether virtuous – and had the ingenious Cheeseburger Salad packed with every tasty bit I craved, sans bun. The pickled onions were a nice touch and provided a nice zing to brighten up the richer beef-and-cheesy goodness. I mentioned virtue was out the window, correct? 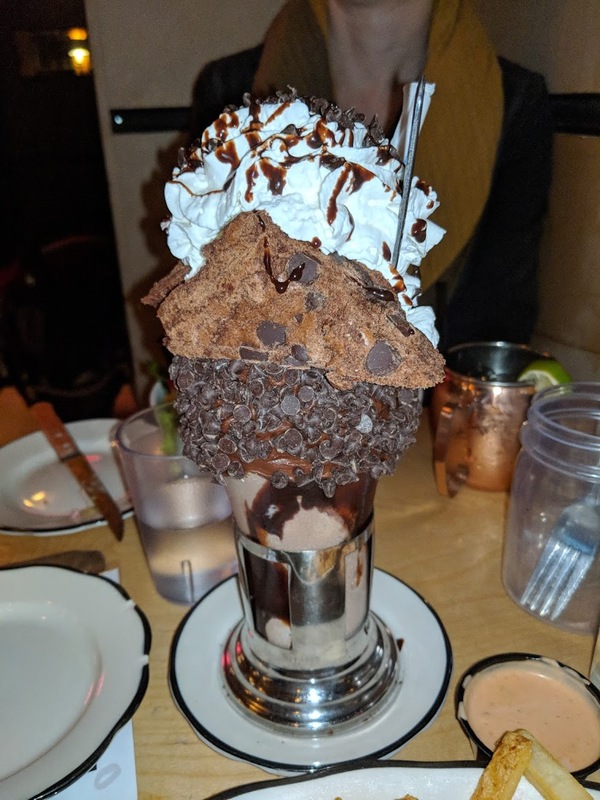 Next up was this epic concoction – a milkshake that moonlighted as a monster brownie, topped with an insane heap of whipping cream. Overall, Black Tap was very fun, tasty, and you’ll leave absolutely stuffed even if you ‘only’ have a shake. Good thing Central Park is just a few blocks away where you can walk away some of the damage.